Did you hear the one about the Japanese comic who tried to make 100 Dundonians smile? Japanese comedian Dandy Sakano is hoping to tickle Dundee's funny bone as part of a TV show set in the city. A Japanese comedian has embarked on a challenge to make 100 people laugh in Dundee. Dandy Sakano has landed in the city as he stars in a quirky Japanese TV programme that promotes recycling. The theme of the show, which is being made for Osaka-based sustainable synthetic company Teijin Ltd, is the "recycling" of a TV star. 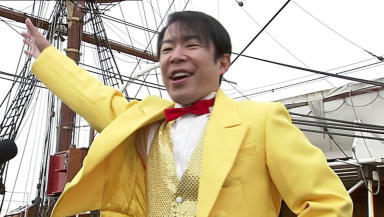 Dandy, who is famous for his catch-phrase “Gets” in his homeland, has experienced a dip in popularity lately in Japan. So a TV crew has brought him to Dundee for the show, part of which is a street challenge, where he will try to make 100 Dundonians laugh. A group of Dundee University students helped to welcome the Japanese TV star, who was dressed in a flamboyant yellow suit, at Discovery Point on Tuesday afternoon. Masami Dederichs, who is organizing the comedian’s stay on Tayside, said: “We thought it would make recycling more familiar and friendly to everybody, that’s why we decided to recycle a TV star. “Dandy is a very famous and very funny comedian in Japan, but we haven’t seen him on TV as much anymore. So we thought he would be ideal for this. On Tuesday Dandy and the crew were filming one of the final scenes of the show, where he is greeted with confetti and applause at Discovery Point. Steward Murdoch, director of leisure and communities at Dundee City Council, also starred in the scene where he made Dandy an honorary Dundonian.